THE PRESIDENT: Thank you, everybody. Thank you very much. Great honor. And thank you to my truly great friend, Vice President Mike Pence -- he’s terrific. (Applause.) And thank you to Miami. We love Miami. I'd love to hear Trump explain exactly what happened to Mr. Warmbier. Because while his parents are probably happy to have him back, he's a comatosed shell. Where's the tough guy response that he promised on the trail? Also, my dear friend, Steve Scalise, took a bullet for all of us. And because of him, and the tremendous pain and suffering he’s now enduring -- he’s having a hard time, far worse than anybody thought -- our country will perhaps become closer, more unified. So important. He took a bullet for all of us? What's that supposed to mean? If you want us to become unified, push for background checks -- you know the gun safety thing that has over 90% support? Clipping out the back-and-forth lovefest between Trump and a deplorable. We are delighted to be joined by so many friends and leaders of our great community. I want to express our deep gratitude to a man who has really become a friend of mine -- and I want to tell you, he is one tough competitor -- Senator Marco Rubio. (Applause.) Great guy. (Applause.) He is tough, man. He is tough and he’s good, and he loves you. He loves you. Little Marco has grown up? And I listened to another friend of mine, Congressman Mario Diaz-Balart -- (applause) -- and I’ll tell you, I loved what he said, and I appreciate it. Mario, I appreciated what you said so much. In fact I was looking for Mario. I wanted to find him -- they said he was onstage. I almost dragged him off the stage to thank him, but now I’m thanking you anyway. Thank you, Mario. That was great. Really appreciate it. For those of you new to Trump's speeches, he always names names and the people are never there. It would be comical if it wasn't sad thinking that he's supposed to be leading us and yet is in a constant battle with his dementia. And I also want to thank my good friend, and just a man who was of tremendous support in the state of Florida, for being with us -- Governor Rick Scott. (Applause.) Great job. He’s doing a great job. I hope he runs for the Senate. I know I’m not supposed to say that. I hope he runs for the Senate. Rick, are you running? (Applause.) I don’t know. Marco, let’s go, come on. We got to get him to -- I hope he runs for the Senate. I promised you -- I keep my promises. Sometimes in politics, they take a little bit longer, but we get there. We get there. Don't we get there? You better believe it, Mike. We get there. (Laughter.) Thank you. Thank you. No, we keep our promise. This speech feels like something that should have been given in the late-1950's. Hey Google, do you have something to tell Trump? Yes, Cuba had a dark past. But Castro is dead and it's time to help them move on from that past. We enslaved millions of Africans and slaughtered countless millions of Native Americans. Should we be cast away from the world as a pariah as well? On my recent trip overseas, I said the United States is adopting a principled realism, rooted in our values, shared interests, and common sense. I also said countries should take greater responsibility for creating stability in their own regions. It's hard to think of a policy that makes less sense than the prior administration’s terrible and misguided deal with the Castro regime. (Applause.) Well, you have to say, the Iran deal was pretty bad also. Let's not forget that beauty. So you're admitting that this is really about President Obama and not really about Cuba? The previous administration’s easing of restrictions on travel and trade does not help the Cuban people -- they only enrich the Cuban regime. (Applause.) The profits from investment and tourism flow directly to the military. The regime takes the money and owns the industry. The outcome of the last administration’s executive action has been only more repression and a move to crush the peaceful, democratic movement. Another big fat lie. Cuba has slashed its military spending by 300% over the past two decades. #WhenTrumpGoesToJail I will personally mail him a Cuban flag. I am announcing today a new policy, just as I promised during the campaign, and I will be signing that contract right at that table in just a moment. So we're embargoing them and blocking major streams of revenue but they're supposed to open private businesses? Counter-intuitive doesn't even begin to tell the story. The embargo caused so much awful for the Cuban people during the first 50+ years so let's go right back to it again! Trump really has no idea how diplomacy works. No wonder every major world leader openly mocks him. 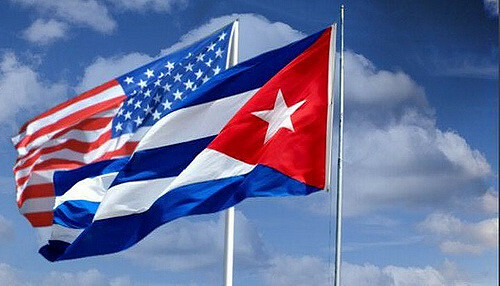 Any changes to the relationship between the United States and Cuba will depend on real progress toward these and the other goals, many of which I’ve described. When Cuba is ready to take concrete steps to these ends, we will be ready, willing, and able to come to the table to negotiate that much better deal for Cubans, for Americans. Much better deal and a deal that's fair. A deal that's fair and a deal that makes sense. So we're shutting it all down except for the embassy? I guess he's having his chocolate cake and eating it too. And eating Cuba's while he's at it. I can't wait until we can reject him and his klan of oppressors. So I want to thank Miami. I want to thank Little Havana. Havana, we love. Do we love it? Would you move anywhere else? You wouldn't move to Palm Beach, would you? No. No way. Little Havana. And I want to thank all of our great friends here today. You've been amazing, loyal, beautiful people. And thank you. Don't remind me. Actually, I was telling Mike, so it was two days -- on my birthday -- until a big day, which turned out to be tomorrow -- the 16th. That was the day I came down with Melania on the escalator at Trump Tower. That's tomorrow. (Applause.) So it's exactly tomorrow -- two years since we announced. And it worked out okay. Worked out okay. (Applause.) It's a great honor. Believe me, it's a great honor. Right? I just want to end by saying may God bless everyone searching for freedom. May God bless Cuba. May God bless the United States of America. And God bless you all. Thank you. Now I'm going to sign. Thank you. I'm not sure there's going to be anything left to salvage when he's done dismantling a century of foreign policy developments. What Trump is doing to the State Department may take a generation to repair.